The end of summer brings with it the end of peach season. A staple in my family for homemade peach crisp, peaches have a wonderful color palette of pinks and oranges. 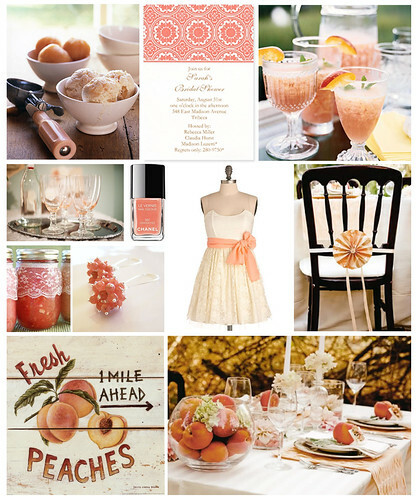 Feeling inspired by my local “Olde Tyme Peach Festival,” which features old fashioned family fun, fresh food and even a parade in honor of the fuzzy summer fruit, this soothing color combination makes for a lovely end of summer bridal shower. Decorate the bride-to-be’s chair with an elegant peach colored ribbon -- Carter & Cook Event Co.
Place fresh peaches around the table and in a glass bowl to create a unique look -- Carter & Cook Event Co.